Located at the end of Weke Road, the bay front road, and aligning with the middle of the bay, is pretty darn perfect. From the Upstairs living room you are looking straight out North to the center of Hanalei Bay, framed and accented by palms and ironwood trees. From the lanai you have the perfect perch for watching the surf, kite surfers, boats and beauty while having a meal or evening cocktail. The only thing nicer than being on the lanai is perhaps floating in the water & enjoying the beach. Not all of vacation life is with out some slight toil. If you need to wash clothes, the Upstairs, Downstairs and Old Style share the coin op washer & dryer in a cute little building just steps away. There is also a hot & cold water shower on the side for rinsing off sand & salt after the beach (way more fun than showering inside. You never know what you will see on the beach. Many people come here to get married, renew vows, celebrate anniversaries, birthdays, even to get baptized! Canoe races, surfers, kite surfers, fishermen, boaters, volleyball players all enjoy the beach and bay. Even with all this activity, most people experience the beach with fewer people on it than they could have dreamed. Whatever is happening in the water, you'll be in the picture when you come to Hanalei. You will enjoy, sun, rain, surf, rainbows, and a great little town set in a fabulously beautiful location. Hanalei mountain views from the property and the bedrooms. Coin op in separate wash house in yard. (2) Flat screens in living & bedroom . Large lawn between the house and the beach. Great location, fantastic views from the porch, comfortable bed. Could be upgraded a bit but we didn't go to Hawaii to sit inside all day. Had everything we needed. Plan to go back again. Quiet, quant and just what we wanted! This is a quant two bedroom house that was perfect for what we wanted. It is quiet and away from the resorts. It is located about 2 miles from the shops and 5 from the golf/resort. So if you need something it was close! Just what we were looking for! This is one of the best rentals we have ever done. Definitely exceeded our expectation. It's a nice, clean, well maintained unit with a comfortable bed. Small kitchen had everything we needed. Very Quiet location at end of road. Owners and management provide amenities more like a hotel than a VRBO. 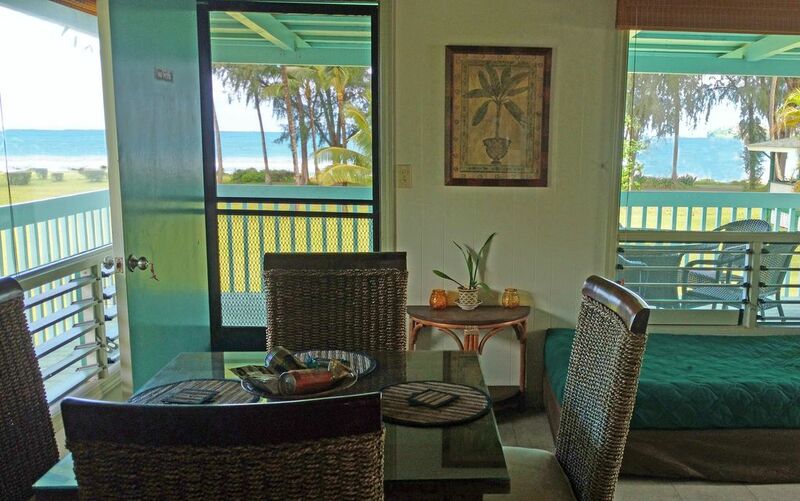 Highlights are great view from the deck and proximity to Hanalei town. You could stay here for a week and not need a car. Amazing experience at Aunt Lydia's! Aunt Lydia's was amazing to say the least. I travel quite a bit and this was by far the most comforting place I've ever stayed in. The outside showers, 2 minute walk to the beach and provided amenities were perfect. Couldn't have asked for a better time. Will be back. We thoroughly enjoyed our 8 day stay in this wonderful 2nd floor home. Everything was perfect and it was wonderful to be right on the ocean. Loved the big covered porch and beautiful lawn leading to a perfect beach (never crowded) and ocean ... So relaxing and quiet ... Not too far from town though we drove to save time. Nice to be a little separated from the main action area of the town. The home was rustic / perfect for an island feel and contained everything we needed. The home was very clean and air conditioning was never needed due to the wonderful breezes. Suzanne was available by phone for any questions and tips for enjoying the area. We'll be back to stay at Na Hoku for sure! Just wish our stay was longer or that we could relocate to Hanalei tomorrow! Kite Surfing in the bay during windy months. Hawaiian canoe paddling as well. Extra guests beyond 4 are $15/night plus tax The $100 security deposit is to cover any extraordinary cleaning costs. It will be refunded with 14 days after you leave in good order. You must fill out a rental agreement and email it to us.